Finally, the seemingly endless battle to get a licence for Pretoria’s Tshwane TV has come to a victorious end. Launched only last week, the station went on air. “The right experience was lacking in the brand and that is why it took so long to start this project,” said Collin McKenzie, sales and marketing director of Tshwane TV. “I had been with the SABC for 15 years before I joined Tshwane TV and at the SABC I did a lot of groundwork, which included the World Cup. 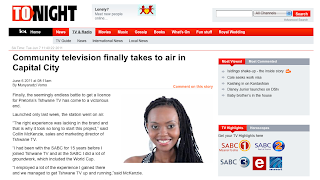 “I employed a lot of the experience I gained there and we managed to get Tshwane TV up and running,”said McKenzie. He explained that the most important focal point for them was content. “You may have a licence, but in the end it all boils down to content and we feel we have addressed that adequately. We will have 50 percent local content in Tshwane, 30 percent national and the rest is 20 percent. We have unique shows like chats with the mayor, where once a week the mayor of Tshwane appears live and answers questions people may have,” he explained. In an environment where community TV is on the rise and yet faces stiff competition from established channels, McKenzie said from their launch last week there were signs that good things were coming. “It is expected that when a channel airs for the first time there are bound to be glitches here and there. When Soweto TV first launched, they had no audio and Top TV had a blackout. This is stuff that just happens, but when we launched, we had no single problem,” he said. Reality show Big Brother’s South African contestant, Nkuli Ngqola (pictured), who was evicted recently from the show, also happens to be part of the Tshwane TV family. What may have seemed like bad fortune when she was evicted now looks like perfect timing as the station she had been working for has now formally launched. “I was an intern for the station since August and I learnt a great deal of stuff about visual journalism. This included all the work behind and in front of the camera. “I am happy we launched the station finally because we are in the process of having a magazine show which I will be hosting,” said Ngqola. She said the show was going to cover travel, lifestyles, fashion and entertainment. “It’s almost like Top Billing, but not quite. We will have our own take on South African lifestyle stories so people should be on the look out,” she enthused. For now Tshwane TV is only available on the UHF band of your TV. Unlike Soweto TV, it’s not hooked up with DStv. “We are interested in having it accessible for free to people all over. “There is a chance we will have it there in the future, but for now this is where we are,” said McKenzie. He also said the radius of the signal reached places like Sandton, Midrand, Mabopane, Kempton Park and Tembisa. McKenzie explained that the brand was open to new ideas so those interested in having their ideas commissioned should approach them. The proliferation of the community TV in South Africa is rising at a rapid rate and McKenzie feels that is a positive thing for media growth. “The thing is people want ownership and responsibility for their own stories. “They also prefer being addressed in their own languages. Newspapers cater for that, but TV was lagging behind. Community TV is the answer to that,” he explained.